Valentino Rossi wins Catalan GP after starting from the 5th position in the race.Initially Jorge Lorenzo was leading in the race and while he was in 5th position he crashed with Andrea Iannone. Rossi's bike was looking good today and he had a good start and climbed up to the first position beating Marc Marquez. 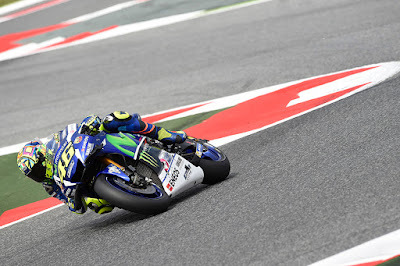 Rossi was in a great pressure and he want's to win the championship so he is working hard to achieve it. As we have seen Jorge Lorenzo had crashed in the race it is actually an advantage for Valentino Rossi because he will have less gap in the championship point table. The race was good for rossi and he was able to beat Marquez. The point is that the Yamaha Bike was awesome today and the choice of tyre was good for Rossi. Anticipation for the MotoGP™ World Championship race at the circuit de Barcelona – Catalunya continued to grow as the riders sat on the grid, hiding from the scorching sun beneath their umbrellas. Marc Marquez (Repsol Honda Team) was on pole position, but both Valentino Rossi (Movistar Yamaha MotoGP) and Jorge Lorenzo (Movistar Yamaha MotoGP) seemed to have found something on the new layout in Warm Up. High track temperatures had riders cautious about tyre life, everyone expect for the Monster Yamaha Tech 3 riders, Dani Pedrosa (Repsol Honda Team) and Tito Rabat (Estrella Galicia 0,0 Marc VDS) lined up with hard tyres. From fifth on the grid, Rossi was shuffled back in the opening melee and found himself down in seventh as the first lap began to play out. At the beginning of the second lap he and Maverick Viñales (Team Suzuki Ecstar) made an incredible pass on Andrea Iannone (Ducati Team), demoting the Italian to sixth. ‘The Doctor’ was on fire and was almost immediately on Pedrosa’s tail, passing him into the new Turn 10 on the third lap. On lap seven he took the lead from teammate Lorenzo with a classic move into Turn 1. Marquez came back at Rossi in the last five laps; the battle was fierce with no love lost between the two. But two perfect final laps saw Rossi glide to his second win of the season and return the championship to a three-way battle. Marquez launched from pole position for the first time at his home race, managing to hold onto second into the first corner. The local rider soon found himself with Rossi for company, the Italian slipping up the inside on lap six. Marquez was not deterred and soon followed Rossi through on Lorenzo, right back with his great rival. Five laps from the end and they were right together, Marquez doing all he could to wrestle past Rossi. A mistake at Turn 7 on the penultimate lap cost Marquez the chance of winning, taking second and moving to the head of the championship. Marquez leaves his home round with a ten point lead over Lorenzo. A reasonable start from Dani Pedrosa saw him within touching distance of his teammate during the opening laps. Both Lorenzo and Marquez were working hard to break away, Pedrosa happy to match their pace and try and break away. Try as he might he was unable to fend off the aggression of Rossi and Viñales, the experienced Spaniard working hard to take back a hyper aggressive Viñales. A mistake from the Suzuki man gave Pedrosa a lap of calm, the lifelong Honda rider able to pass Lorenzo for third on lap nine. It proved a lonely end to the race for Pedrosa, his second podium of the year going largely unnoticed to the action out front. The situation grew worse with each lap but on lap 17 the almost unbelievable happened as Andrea Iannone left his braking too late at Turn 10, smashing into the back of Lorenzo. Both riders went down, Lorenzo clearly furious with the Ducati rider. Iannone attempted to apologise but Lorenzo was distraught, his championship lead gone. He may have been out of contention for victory, but could have certainly scored points were it not for Iannone. Viñales was more aggressive than ever in the opening laps, slamming himself and his GSX-RR up the inside of any rider ahead of him. His aggression would be his downfall as he made a number of mistakes forced to concede positions and briefly losing contact with the podium battle in the process. The 2013 Moto3™ World Champion rallied found himself battling with the 2015 MotoGP™ World Champion Jorge Lorenzo for fourth. After laps and laps of trying, he finally got past his fellow Spaniard to move into fourth, where he would finish. Rossi gets revenge in Barcelona thriller. ‘The Doctor’ was on fire and was almost immediately on Pedrosa’s tail, passing him into the new Turn 10 on the third lap. On lap seven he took the lead from teammate Lorenzo with a classic move into Turn 1.